(July 19, 2017) – This summer was the first time that Brianna Diaz has ever travelled outside of the United States. 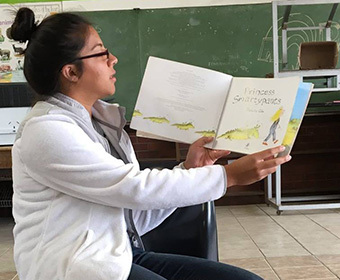 The first-gen student flew alone for 20 hours across the Atlantic Ocean to Johannesburg, South Africa, preparing for a six-week trip as a recipient of the U.S. Department of State’s Benjamin A. Gilman International Scholarship. The Gilman program allows American students to study or intern abroad and gain proficiency in diverse languages and cultures. 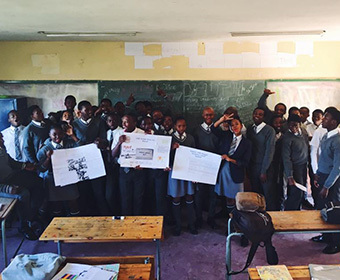 Diaz spent her first two days in the program with the program director and 15 other students touring Johannesburg. They visited museums and Nelson Mandela’s home, and learned about the history of South Africa and apartheid. Then they traveled 350 miles southeast to Durban, South Africa, where they stayed with host families. Diaz lived with a mom whose adult children have moved out of the home. “She helped me a lot. She encouraged me to explore the city and embrace this once in a lifetime opportunity,” Diaz said. During most of the trip, Diaz focused on school practicums. 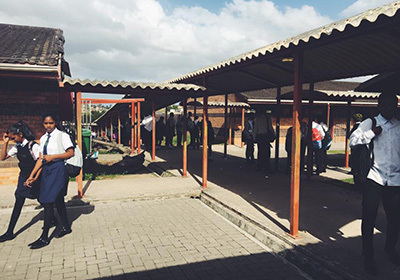 She spent half of her time in an inner city primary school and the other half at a secondary school in a township where she noticed vast differences. She noticed that the inner city school had more teachers and smaller class sizes. It also offered clubs for students and its students were demographically more diverse. In contrast, the township school didn’t have enough desks for its students and its science laboratory was barely functioning. Diaz said the differences revert back to the apartheid. She said all the students carried a positive attitude about school, something American students often take for granted. Diaz also visited non-governmental organizations to see how they improve student success in the South African education system. Her favorite was called TREE, Training and Resources in Early Education, which works in rural areas where residents don’t have access to early childhood development classes. Members of TREE are training community members to teach these classes. Overall, Diaz said observing how South Africans celebrate their diversity was the greatest learning experience. “We paint ourselves as a melting pot, but after seeing the diversity in South Africa, I see that we still have a lot of work to do in American cultures,” said Diaz. Back at UTSA, the Gilman scholar plans to host a panel to share her personal study abroad experiences with first-generation students like herself. Explore UTSA’s Study Abroad opportunities. Learn more about the UTSA Top Scholar program.